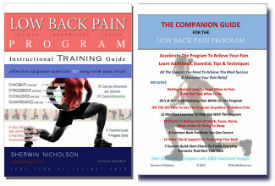 Why Get the Low Back Pain Program eBook? 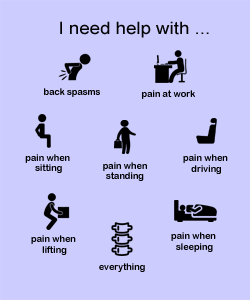 Saves you the inconvenient and time consuming need to search for, and experiment with, exercises and methods that may not prove helpful, safe or relevant for treating your pain. The exercises are already chosen, complete, and ready to perform at your comfort and schedule. Instructions range from simple postural correction and stretching, to balancing and muscular exercises. It is written with the understanding that you may have limited mobility at first and require time in order to progress. 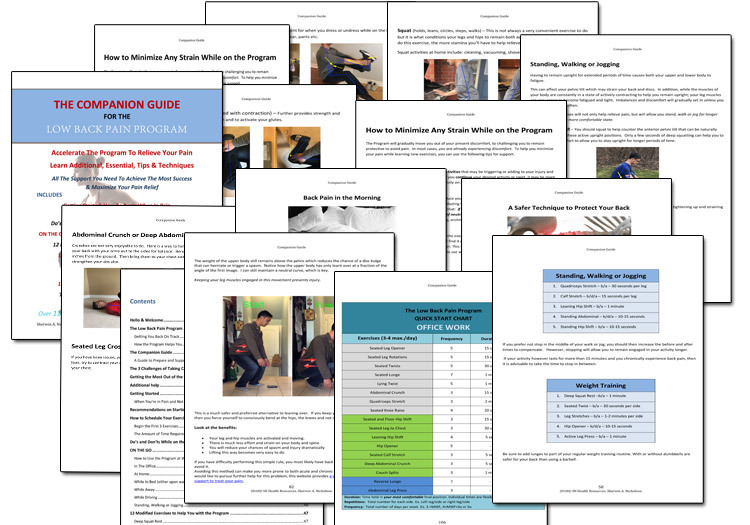 45 Specific and targeted exercises, complete with over 170 full color images each with detailed instruction. Relief experienced in as early as the first week using just the first level. You will begin exercises and movements designed to address any pain, restrictions and Limited Mobility that you may presently have. These exercises will help you to overcome this concern in order to move on to more advanced and important exercises. As your mobility improves, you’ll move on to Progressive Exercises. These exercises aid to strengthen weak and imbalanced muscles and joints in order to protect the back and reduce your level of injury (and consequently pain). Once learned, you will move to the set of Challenging Exercises. These exercises serve to bring back proper function for your muscles and joints and prevent the return of injury to the lower back and other joint related pain. After mastering the three exercise groups, you will only need to use the Maintenance Exercises recommended. These important exercises serve to keep the rehabilitated and reconditioned muscles fit and responsive to any lower back challenges that you may have. The eBook illustrates and demonstrates methods, some of which you may already be familiar with and some new. It is important to read the book in its entirety as it will be an advantage for your recovery. Some exercises will be easy to perform while others will initially be very challenging. In time, the more challenging exercises will become easier as your body develops more mobility, strength and flexibility. Initially, the steps in the book should be performed in their entirety. 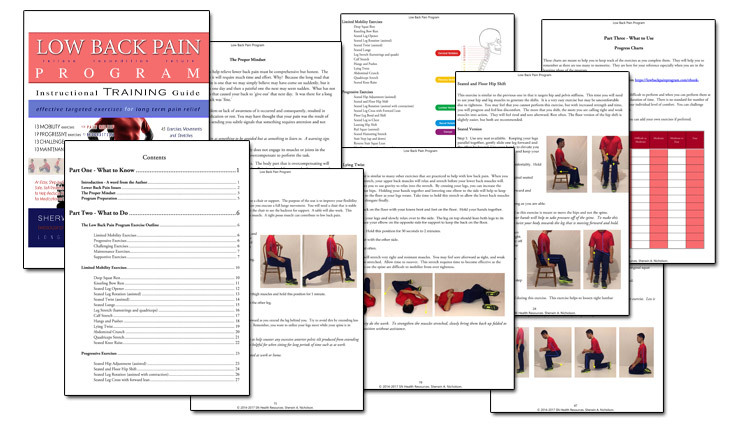 As your pain eases, you can custom select the specific exercises individually with less emphasis on others. Eventually, you will only need to perform the Maintenance Exercises throughout your day as a preventative measure. Helpful Note: As with any serious program, this book takes time and commitment. Weak, sore and injured muscles and joints respond and heal slowly. 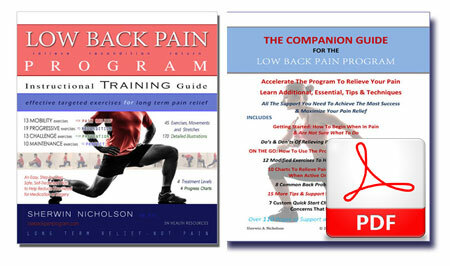 Healthy, reconditioned and responsive muscles and joints protect your spine indefinitely. Where can I order my own copy? Don’t forget the Companion Guide to help you wherever you go & whenever you need relief.